"Frigate Orcan" redirects here. If you were looking for the boss in the DS version, see here. Frigate Orcan is a flying battleship not unlike that from Sonic 3's Angel Island Zone. 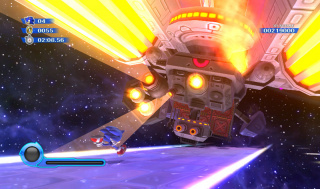 You fight the ship Sonic Unleashed style, running after it on a never ending road and hitting the boss constantly while avoiding its machine guns and spiked balls it drops. Along with the spiked balls, it drops boxes which contain rings, White and Cyan Wisps which can be used to make the battle easier. After enough hits on most of its parts, the ship will fall and you will have won the fight. This page was last edited on 8 April 2018, at 09:48.